CON DAO, Vietnam – January 16, 2019 – Easter holiday is the ideal time to escape the crowds and celebrate with your loved ones. If you are sun-seekers looking for a staycation that is egg-stra special, then look no further. Six Senses Con Dao has combined its top five must-do’s in a special offer for families, with selected Easter break treats. Being touted as one of the best paradises found in Asia by CNN Travel, nestled in the heart of Con Dao National Park and surrounded by deep blue water, Six Senses Con Dao will make you feel at one with nature and off the beaten track at its remote and tranquil location. You will be wowed by a mile-long stretch of immaculate beach sparkling beneath the April sun. If you are wondering which villa to choose, consider a two-, three- or four-bedroom pool villa, all with ensuite facilities and privacy, allowing family members to have their quiet space when needed. All family villas have a generous communal space for activities such as entertainment, dining, relaxation or enjoying a game of cards. Steps away from the lounge area is a private and spacious pool for the whole family to enjoy. And only a few steps further is the resort's expansive beach, arched by two small peninsulas. Easter dinner calls for celebrating and our menu of tasty main courses, stunning sides and sweet desserts will ensure a memorable family gourmand gathering. Traditional Easter dishes are highlighted with freshly picked ingredients and herbs straight from the organic garden. Chef Daniel Woodbridge will surprise you with his talent of combining local ingredients with Western techniques that make his dishes full of creativity and bold flavors. Kick off Easter with something amazing and uplifting. A sunset water excursion for the whole family must be tempting enough. Cruising around the island, traveling to the western side of Con Dao, passing by Ca Map Cave and Dinh Tinh Yeu (Lovers Peaks), this two-hour tour guarantees an unforgettable journey which finishes with the sun slowly setting into the horizon. 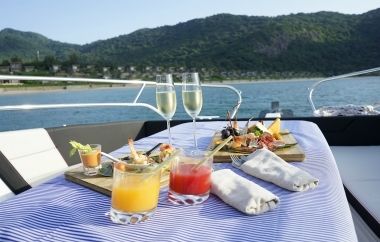 Sipping champagne and soft drinks while enjoying savory delicacies on an out-of-the-ordinary cruise experience that is definitely a must-do at Six Senses Con Dao. With plenty of activities at your fingertips, there’s not a chance of boredom. From young ones to the teenagers and adults, there is lots to do for the whole family. For nature-lovers, turtle hatchling release, clam collecting and jungle trekking are prime options. For more active and adventurous experiences, our watersports, snorkeling and affiliated scuba diving operator has the perfect choices. So, if you haven't planned your next holiday trip yet, Six Senses Con Dao should be on your bucket list. Book now to benefit from our exclusive offer this Easter. From only USD 780++ per night for two guests, Easter inclusions include ocean view pool villa accommodations, daily buffet breakfast, a Sunset Getaway, one set dinner per guest (food only) and one USD30++ spa credit for each adult to be used during their stay. Resort activities include an eggs hunt, egg decoration, happy hour, family yoga, the singing bowl and more. Round trip van transfers between the resort and Con Son Airport are included for the standard number of villa occupants. Families are welcome and up to one child (under five years old) can be accommodated in their parent’s villa at no additional charge. Terms and conditions applied. Offer for accommodation of two-, three- and four-bedroom units for families or groups of four, six and eight guests are available upon request. Book now until March 10, 2019 for stays from April 1 to 30, 2019. For further information on these special offers, visit www.sixsenses.com/resorts/con-dao/offers or contact the reservation team at + 84 254 3831 222 or reservations-condao@sixsenses.com. 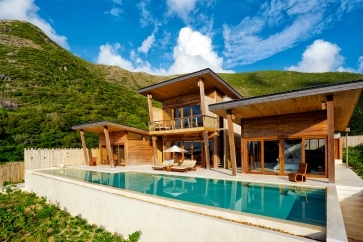 Six Senses Con Dao is located in a national and marine park. Comprising 50 contemporary pool villas, it offers several dining options with seafood and a focus on world cuisine. The Six Senses Spa has a backdrop of the Lo Voi Mountains, plus there are activities to entertain all ages.